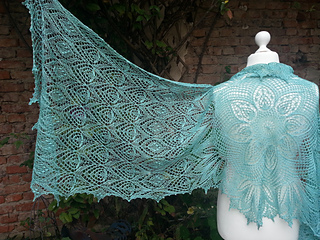 This is the sixth Canadian province to get it’s own shawl design through the LittleGreenDragon. 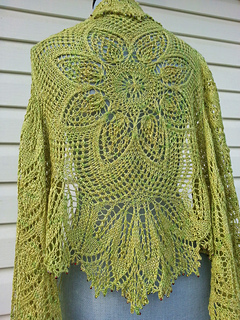 The provincial flower of Prince Edward Island is the orchid called “The Lady’s Slipper”, and this flower adorns both the center and the edges of this lacy shawl. 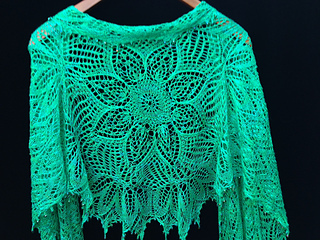 The shawl even has a shape that resembles the island, with a center and two wings stretching out. Difficulty: medium to advanced. Charts only. Yarn: 2 skeins of Zitron Filisilk, 70% merino 30% silk, 656 yards (600 m) / 100g. You will need 160 g for the white shawl as shown. Size: 28 inches (70 cm) wide, 60 inches (180 cm) long when worked as written. It is easy to change the length of the shawl, this is described in the pattern. To change the width, change needle size and/or use a different weight yarn. Needles: US 4 (3.5 mm) circular needle or the needle you need to get a fabric you like. Double pointed needles (dpns) in the same size for the circular CO, or use a long circular needle and magic loop. Gauge: One repeat worked according to chart D (14 sts) is 3.4 inches (8,75 cm) wide blocked and relaxed. 40 rows is 6.3 inches (16 cm). Beads: Seed beads size 8/0: 176 beads for the center flowers, and 400 beads for each repeat of the flower motifs. 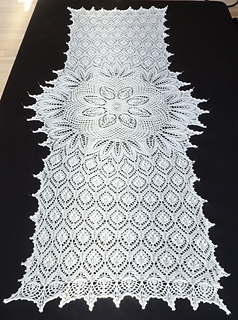 576 seed beads in all for the white shawl as written. And drop beads 3.4 mm or magatamas 4 mm for the picots, according to taste. You will need 250 drop beads for the white shawl as written. Beads are optional. The purple shawl shown in the pattern uses 976 beads, only the last two rows of flowers are beaded. Had the flowers at the beginning of the wing been beaded too, I would have needed 1376 beads. Other notions: Stitch markers. Crochet hook or other gizmo for placing beads. If your beads are a little irregular, using a piece of bendable fishing line or the like is a practical solution. Drop beads may require a 0.5 mm or smaller crochet hook for placement, as the holes are tiny! Darning needle. Construction: The shawl is worked in the round from the center out until final width is reached. Then the two sides are extended to form the ”wings”. No grafting needed. Sides can be worked straight as in the white shawl shown, or at an angle to form a V-shaped shawl.